Deputy Chief Matt Wallace, Officer Tim Blankenship, and Mayor Mike Chamberlain offer a table full of information and giveaways at BOCO. The Boone County Business and Service Expo at the Community Center Building Complex, 111 W. 1st St., was held on Saturday, Feb. 2 from 9 a.m. to 3 p.m. 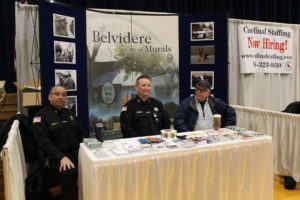 Hosted by the Belvidere Area Chamber of Commerce, the event had 40 booths to visit, covering two floors, allowing guests a choice of where they would start. The Main Street Players had actors attending their booth. They were happy to discuss the upcoming ‘Guys & Dolls’ show, directed by Jim Crow, featuring gamblers and gangsters, showgirls and beat cops. It is one of the most beloved and performed musicals ever written. This show will be followed later in the spring by the comedy directed by Vince Melillo, ‘A Farce of Nature’ which promises to be a hilarious performance. I visited Growth Dimensions at the right time to hear the owner of Sips ‘n Sprinkles and The Shortline discuss the family’s newest endeavor, The Firebox, a pizza place which will be located across the courtyard from The Shortline. The two businesses will encompass the small courtyard between them when the new place opens in March, if everything goes according to plan. The City of Belvidere and Belvidere Police Dept. combined booth were speaking with Walter Stephens of Habitat for Humanity when I arrived. Stephens was telling them that Habitat for Humanity is planning to build two homes this year. One of the homes will be for a Veteran. Stephens has placed form for Veterans to apply to qualify for the home at the Veterans Assistance Commission of Boone County, the VFW, and with Tammy at Blackhawk Bank. I spotted Mayor Mike Chamberlain and City Clerk Shauna Arco of Belvidere at the expo along with Poplar Grove President Owen Costanza. State Rep. Joe Sosnowski was listening to constituents in his booth and chatting with expo guests all over the event. At the Crimestoppers booth, I learned that, “We have a fair number of people who call Crimestoppers. We are in schools, too – kids can call Crimestoppers. We do not have phone ID so when we get a tip, we give the caller an ID number. If the tip leads to an arrest, they can take that number to Midland States Bank and receive their award money. It might be an amount from $100 up to $1000. 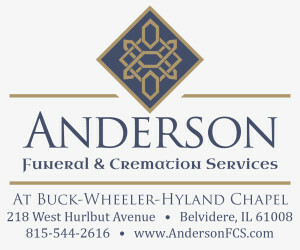 For complete article, pick up the Feb. 7 Belvidere Republican.